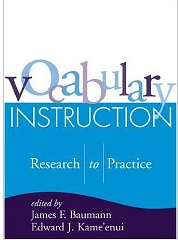 In our April 26th post we shared that Bridget, Dana, and I have written a chapter for the second edition of Vocabulary Instruction: Research to Practice (forthcoming, Guilford Press) to be published in 2011. In our chapter, Using Multimedia to Support Students’ Generative Vocabulary Learning we highlight ways to use digital media to support vocabulary learning. In the chapter, we include multimodal examples, which are reproduced as figures. However in static manuscript form, we found ourselves limited in showcasing these creations, which are meant to be interacted with digitally. This post features each of the examples. What follows is a brief description of teaching ideas from the chapter along downloadable files. These files allow you to click on links and interact with the content to get a better sense of the potentials and possibilities. We hope these creations spark your creative ideas for ways to use digital media to support vocabulary learning! Students often find it difficult to unpack the meaning of words and figurative language within a poem or passage. An alternative way to dive deep into word meaning is to engage them in creating hypertext versions of the text that include links to other media. The original text represents the first layer, and their personal connections and interpretations represent the second, hyperlinked layer. This activity works well in partner groups because it encourages students to talk about and use the targeted words as they design their linked text. PowerPoint, or other multimedia presentation software, can serve as the hypertext medium. To introduce this kind of vocabulary and figurative language exploration, create a 3 slide PowerPoint template. : slide 1 explains the task and introduces how to make a hyperlink within a slide show, slide 2 introduces an example, and slide 3 provides the actual text to be expanded with vocabulary hyperlinks. 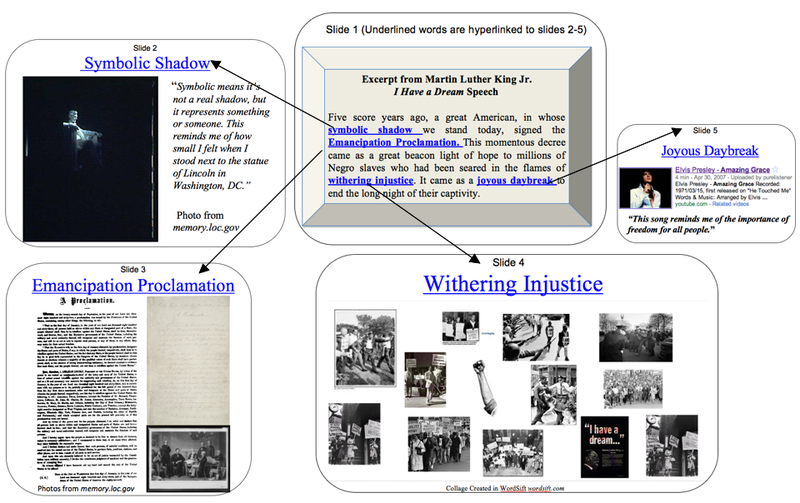 The example below demonstrates how key words and phrases in the opening of Martin Luther King Jr.’s I Have a Dream speech can be hyperlinked to students’ elaborations and connections in different modes. Click Hypertext to download and interact with this example. Creating a multimodal word web is probably one of the simplest and most effective ways to use language and media to express word meanings and explore the relationship between words. To begin, create a basic template that students can customize. At a minimum, the multimodal word web should include the target word or concept, an explanation, and examples of the word in a context. Further, at least two modes should be used such as text, sound, graphics, and video. 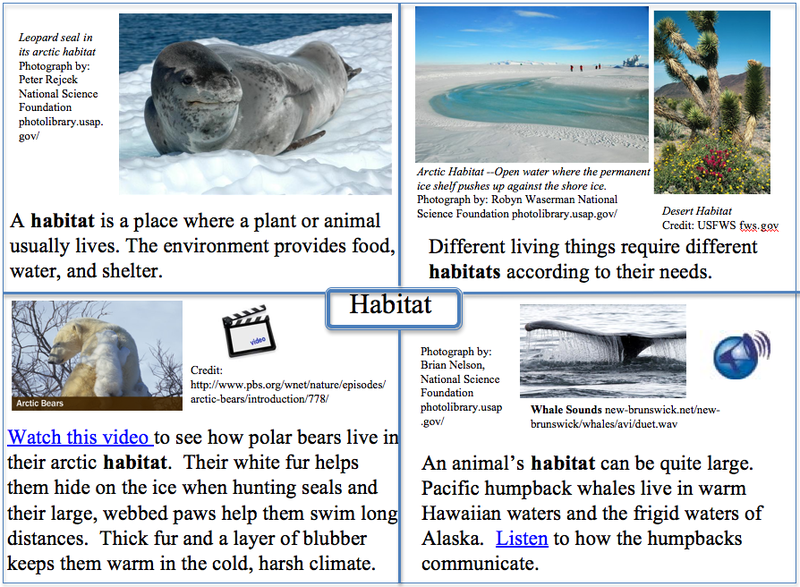 For example, a word web for the target word ‘habitat’ might include descriptive information that defines what a habitat is, as well as photographs of different habitats, video of wildlife in their habitat, and audio clips that offer a chance to hear sounds within a given habitat. In the example below, words come to life. You can listen to whale sounds from the arctic and watch a video clip showing how the polar bear learned how to survive in the arctic, a habitat that offers few comforts. Click Habitat to download and interact with this example. You know the saying, “A picture is worth a thousand words”; the same can be true of a word – what information, memories, images, and sounds are evoked when you hear the word ‘celebrate’ or ‘grandmother’? While we share cultural understandings of some visual symbols, the ways that visual representation can be connected to words is limitless. Even for something as specific as a car, our image memories will vary. To develop both visual literacy skills and vocabulary, challenge students to connect words to images or images to words. 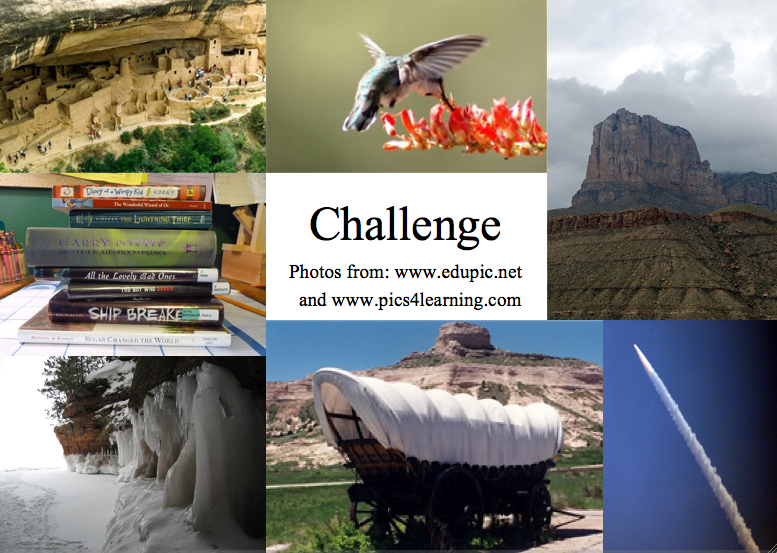 The example below begins with the key word “challenge” together with images that match with it. After students complete such as collage, ask them to add a title and explain why the images are a good representation of the word. This offers an excellent opportunity to teach how to critically read images on the Web. Click “Challenge” to download and interact with this example. Bridget and Christian Ehret partnered to create an example that illustrates the power of video to illustrate word meanings. 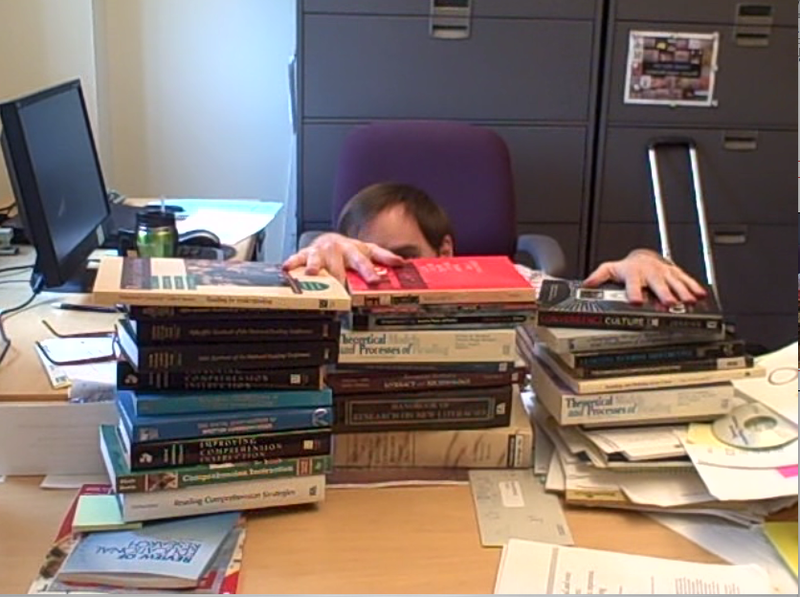 The video opens with a shot of a desk piled high with books. Ehret is sitting on the floor, hidden by the desk. Suddenly, his hand appears, pulling a book off. More books disappear as he pops up repeatedly, looking increasingly distressed. 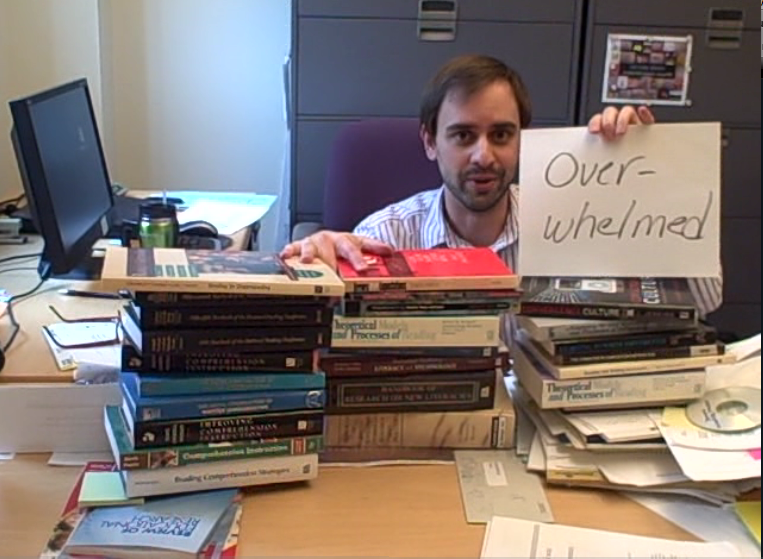 At the end, Ehret appears with a sign displaying the word “overwhelm,” saying, “I’m distressed, drowning in a deluge of books. This is an overwhelming amount of books to read! Can you tell I’m feeling totally overwhelmed? !” Note that all of the italicized words were found on a thesaurus during a Web search the pair did to prepare for the video. They used different forms of the word (overwhelm, overwhelmed, overwhelming) and incorporated related words (distress and deluge) to aid in the development of word concepts. We hope these examples have gotten your creative juices flowing and introduced some new possibilities. We welcome you to share additional ideas for ways you’ve used digital media to enhance vocabulary learning. Please add a comment or send us an email. These resources are fabulous, thank you for creating them and sharing them freely. I especially appreciate the variety of sources and types of media. By the way, the audio clip of the whale sounds quite painfully like a siren. Good thing they live underwater! Thanks so much for your kind words about the digital resources and examples we featured. We hope they spark new ideas and meaningful connections. We’ve really enjoyed playing with these resources. The digital platforms are very flexible and the possibilities are endless.